II.4.7 Pompeii. 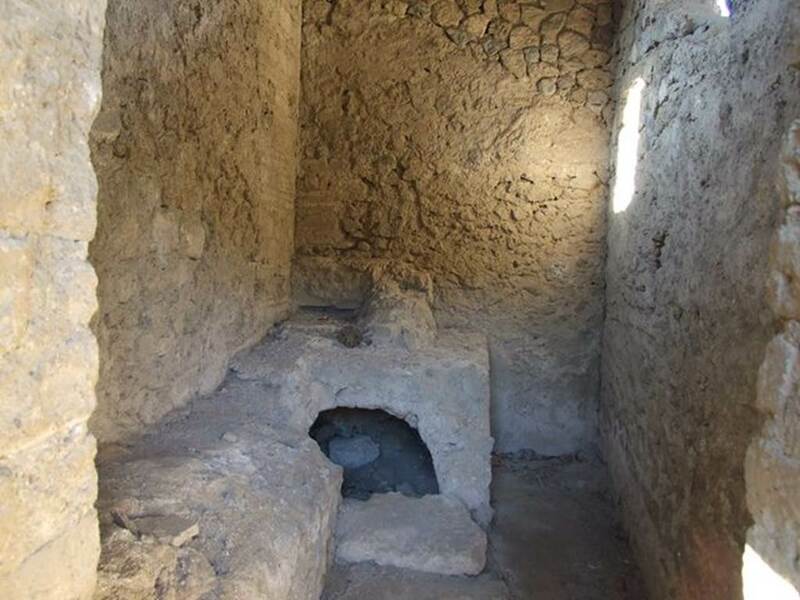 Thermopolium. Complesso di Giulia Felice (Julia Felix) or Praedia di Giulia Felice. 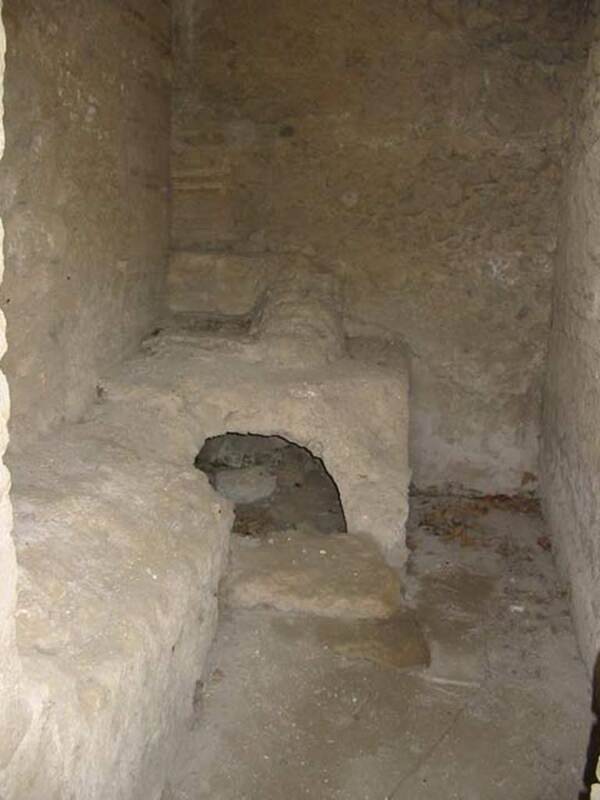 First excavated 1754 to 1757 then re-interred, 1912, 1933, fully re-excavated 1951. 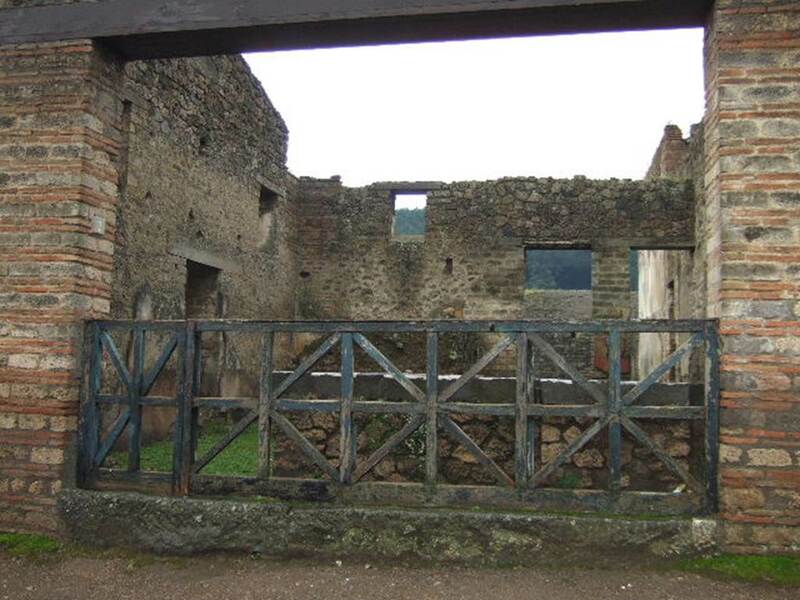 II.4.7 Pompeii. December 2005. 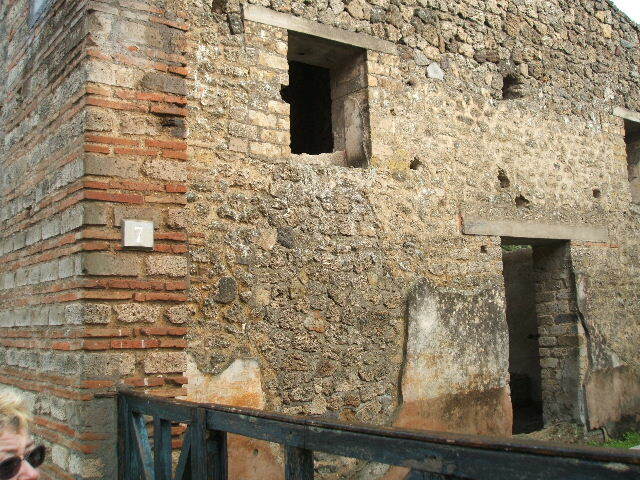 Thermopolium entrance, looking south on Via dell’Abbondanza. 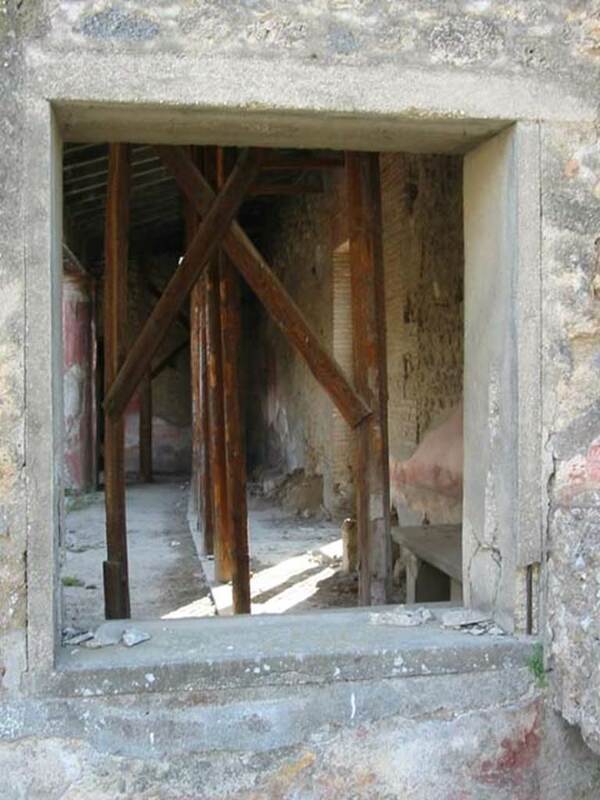 II.4.7 Pompeii. June 2012. 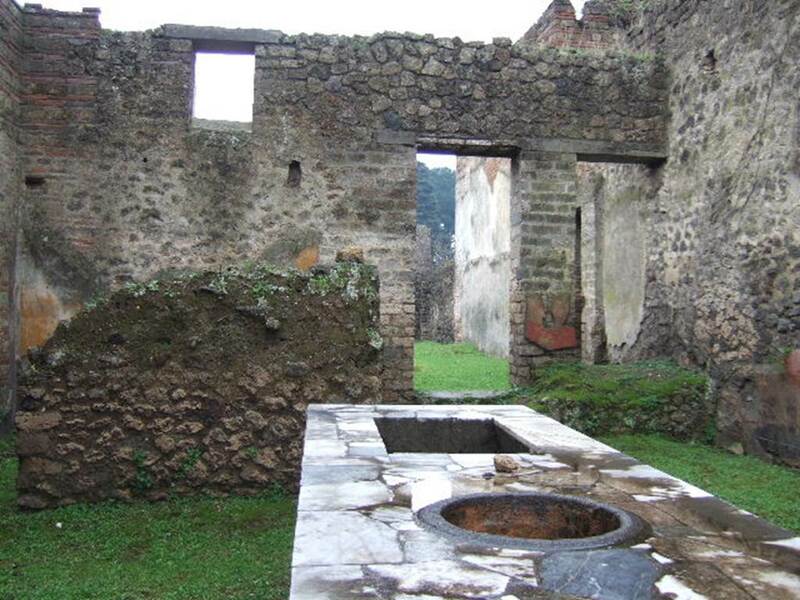 Looking across podium towards east wall with doorway to triclinium, from entrance. II.4.7 Pompeii. December 2006. East wall and doorway into triclinium. II.4.7 Pompeii. December 2005. 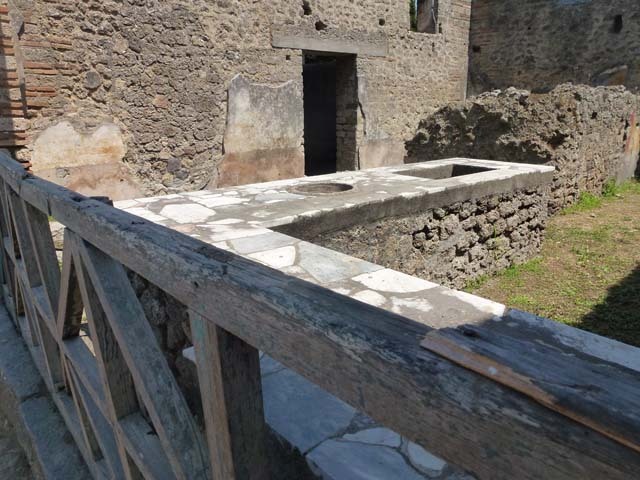 Food counter and doorway in east wall to triclinium. 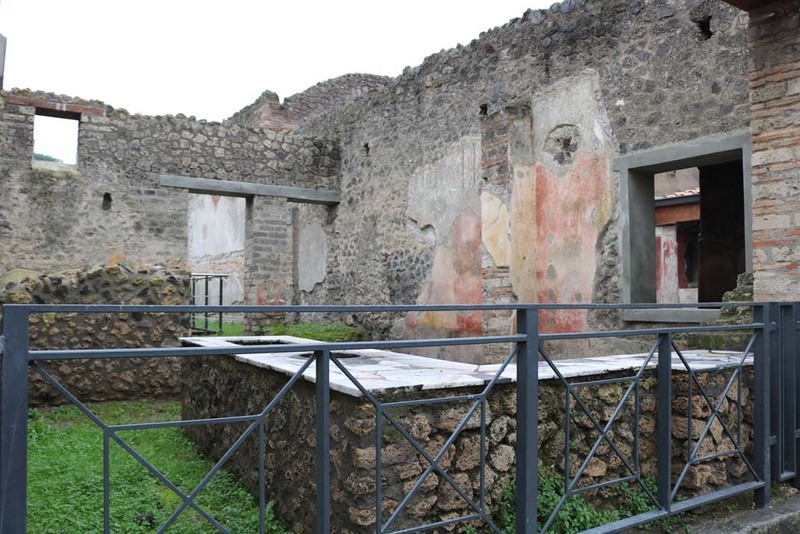 II.4.7 Pompeii. 1964. Triclinium and round table, together with other tables and seats in compartments. Photo by Stanley A. Jashemski. 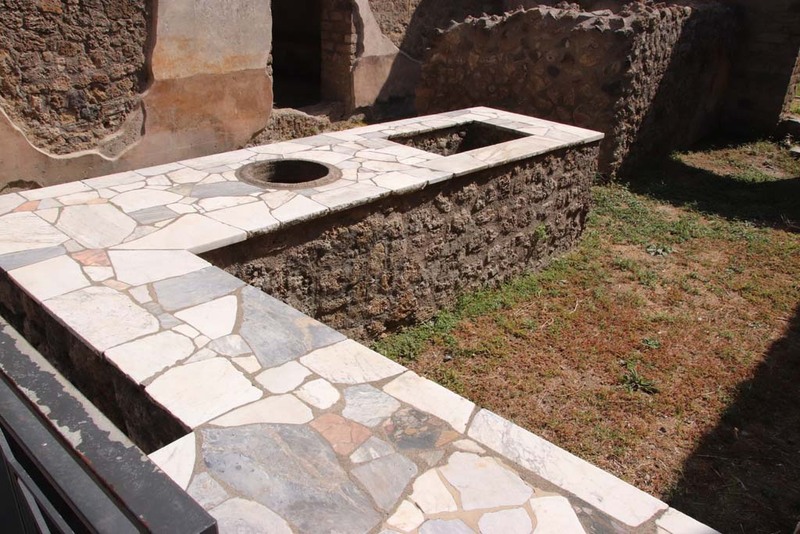 II.4.7 Pompeii. December 2006. 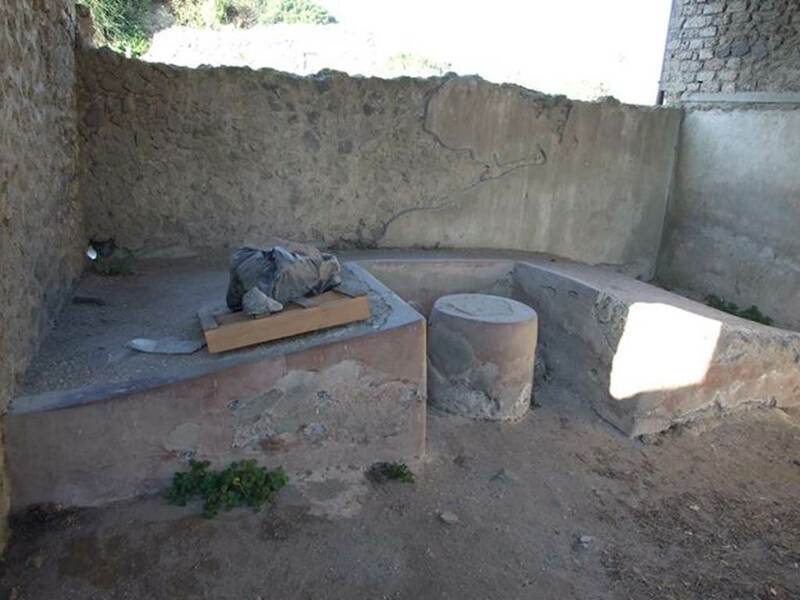 Stone triclinium and circular table. 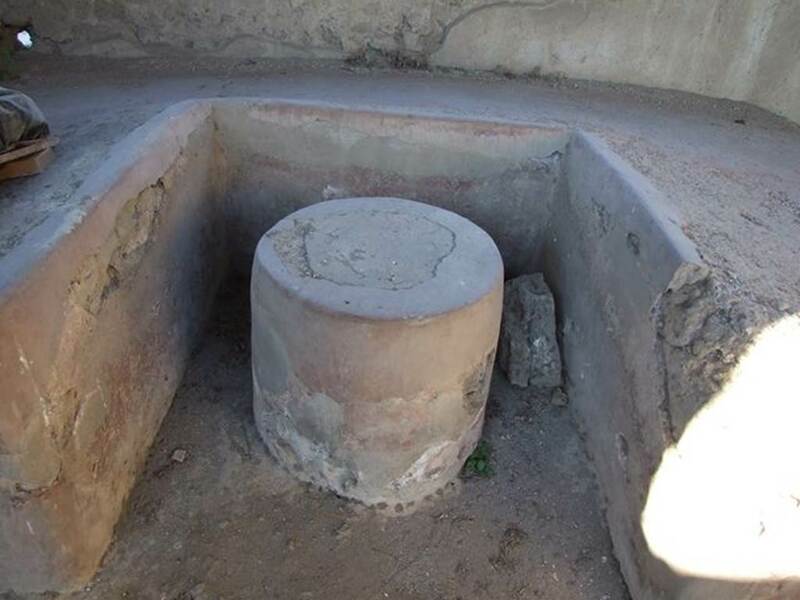 II.4.7 Pompeii. December 2006. 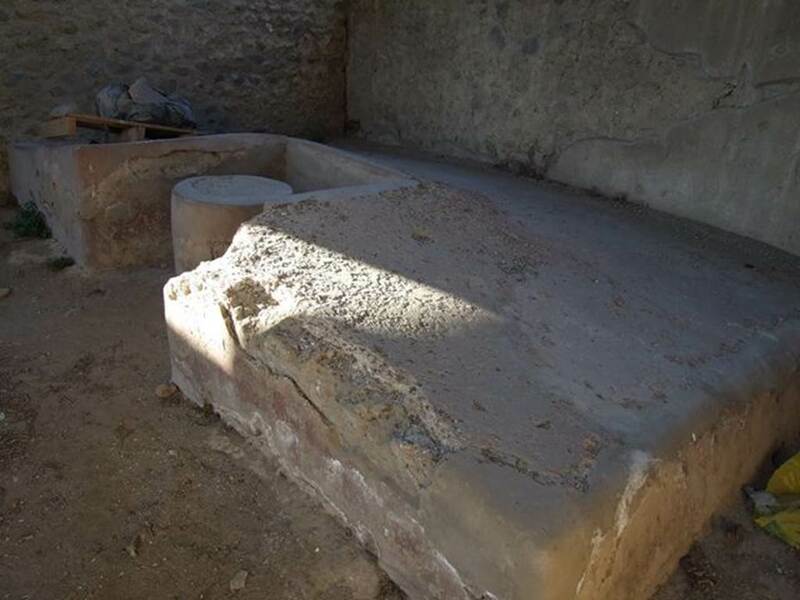 Stone triclinium. II.4.7 Pompeii. May 2003. 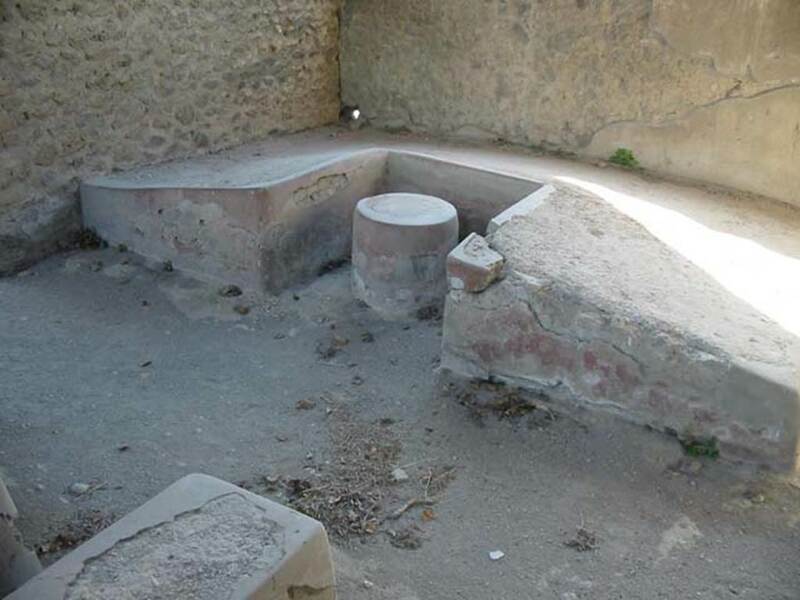 Stone triclinium and circular table. Photo courtesy of Nicolas Monteix. II.4.7 Pompeii. December 2006. 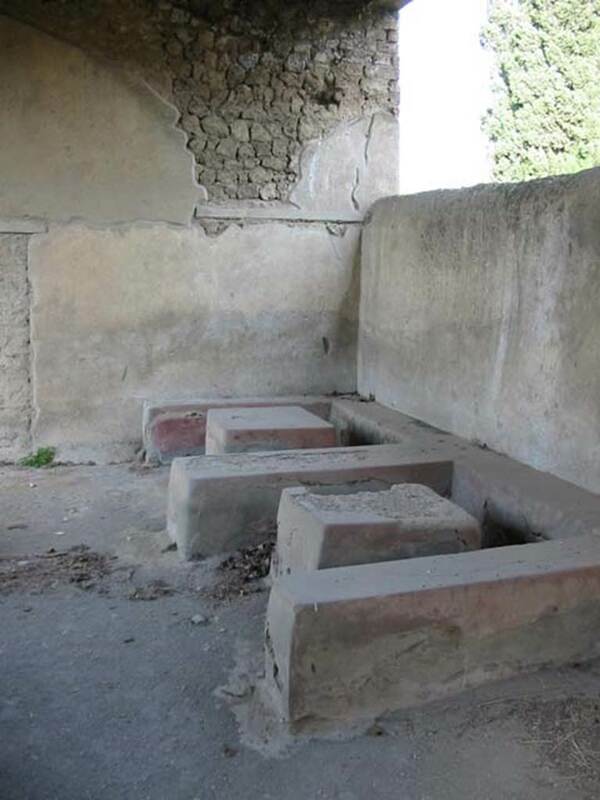 Stone seats and tables in compartments. II.4.7 Pompeii. 1964. 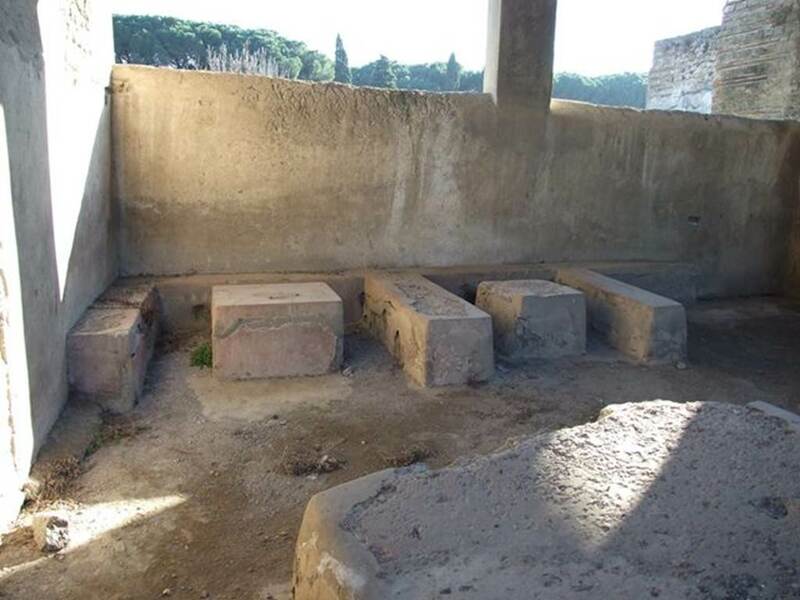 Looking from triclinium towards seats and tables. Photo by Stanley A. Jashemski. II.4.7 Pompeii. May 2003. 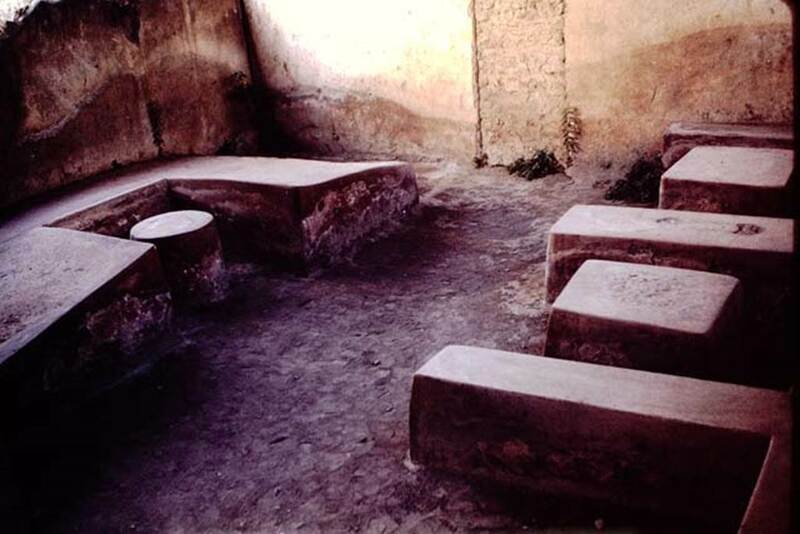 Stone seats and tables in compartments. Photo courtesy of Nicolas Monteix. 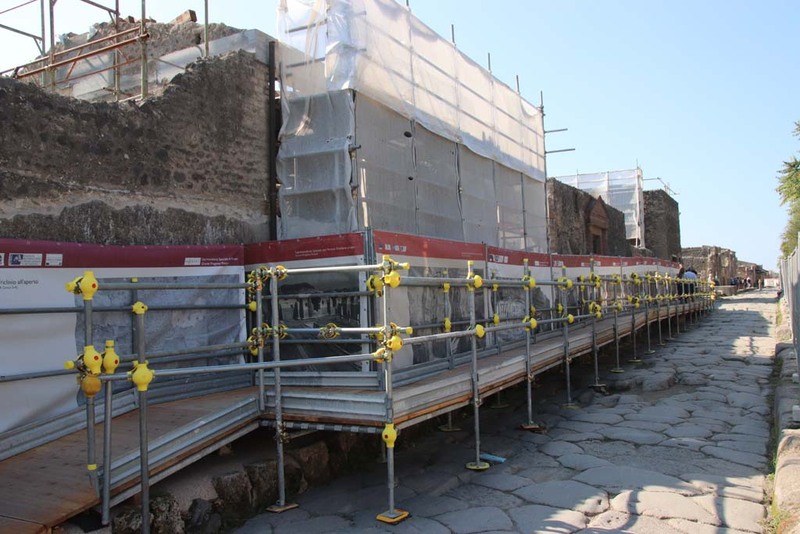 II.4.7 Pompeii. 1964. 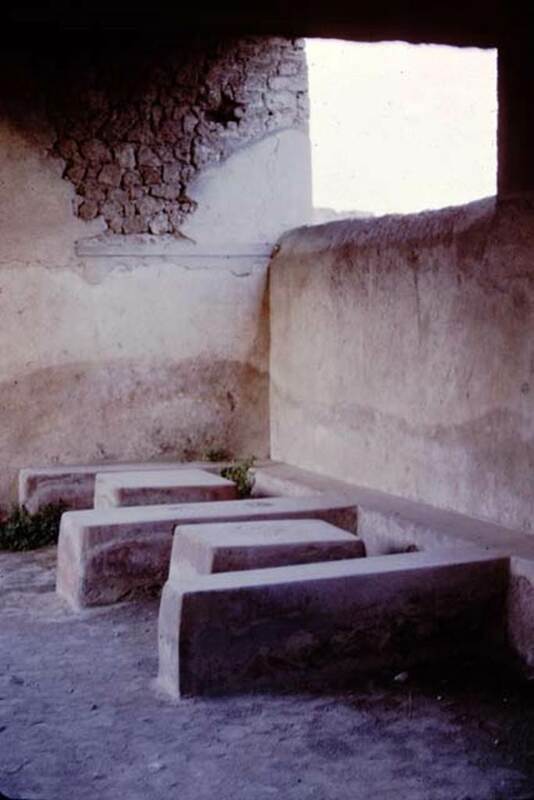 Stone seats and tables in compartments. Photo by Stanley A. Jashemski. 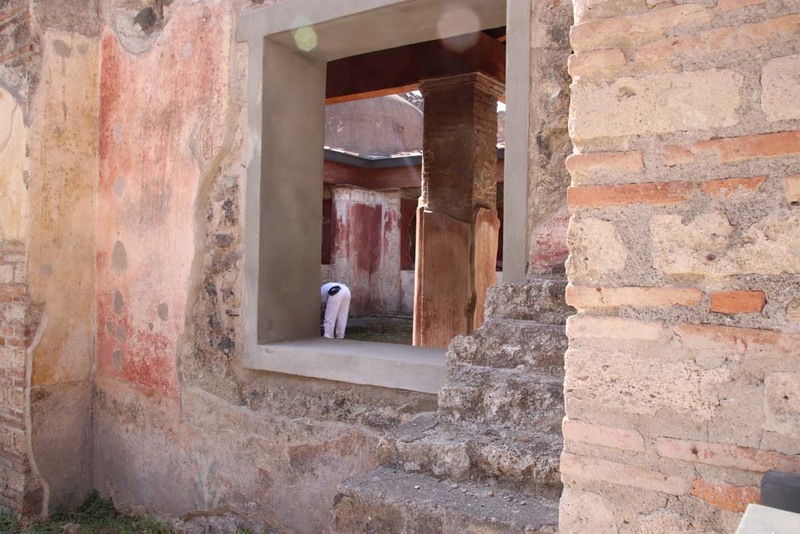 II.4.7 Pompeii. December 2006. 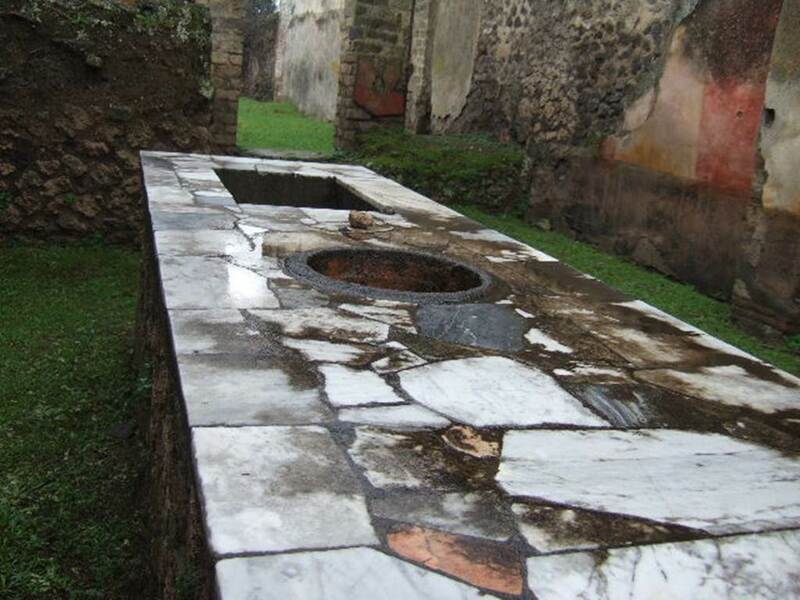 Oven for caupona and thermopolium. 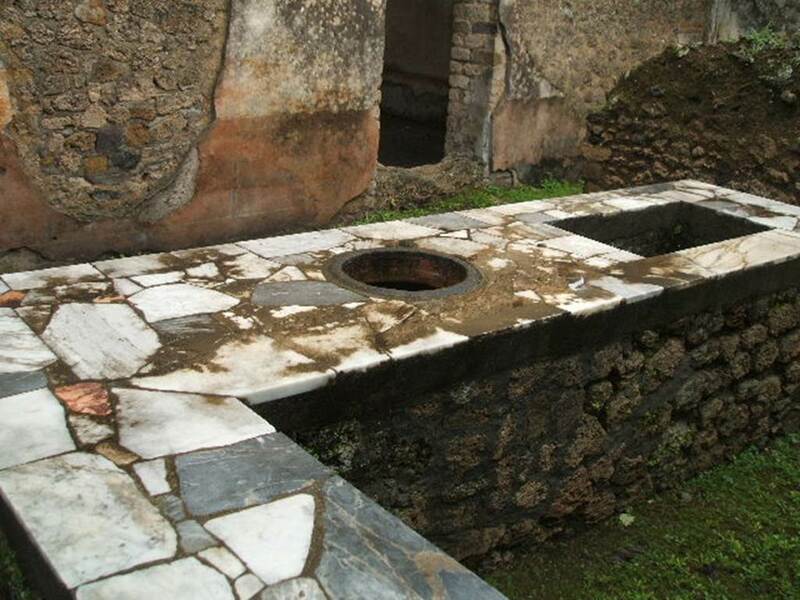 II.4.7 Pompeii. May 2003. Oven. Photo courtesy of Nicolas Monteix. 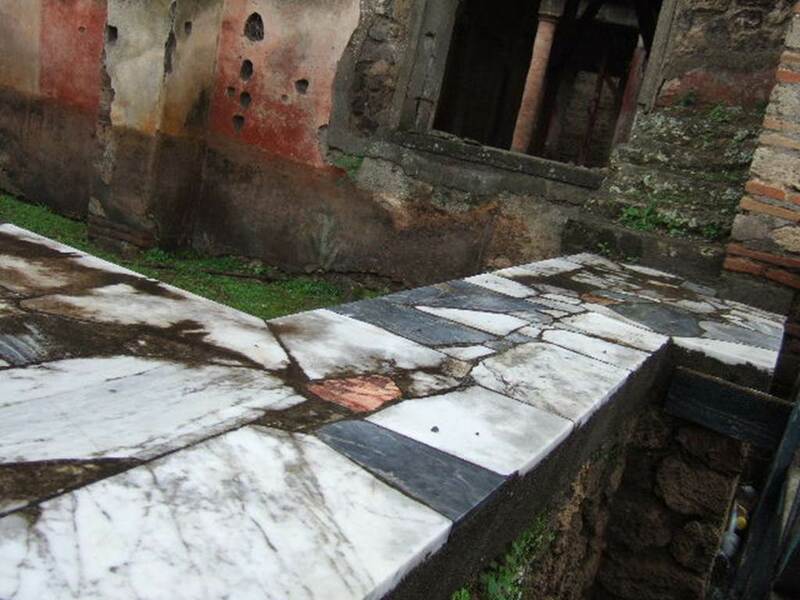 II.4.7 Pompeii. December 2004. Looking west along Via dell’Abbondanza. 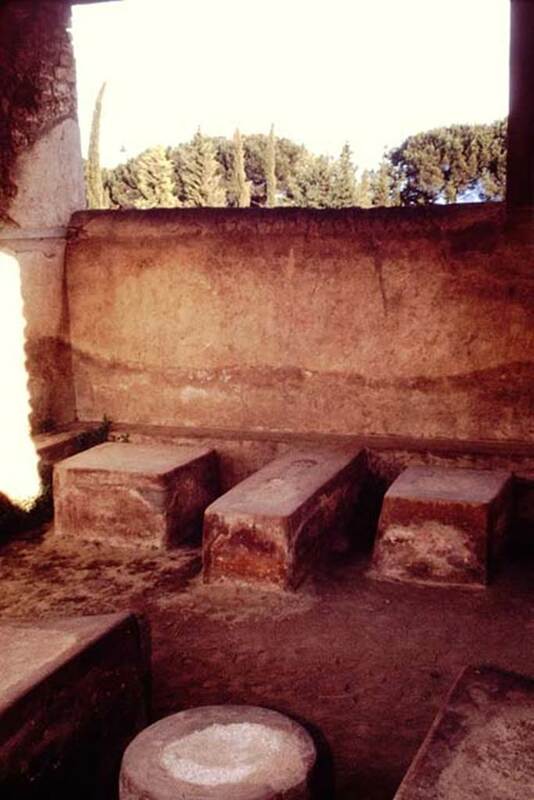 II.4.7 Pompeii. December 2005. 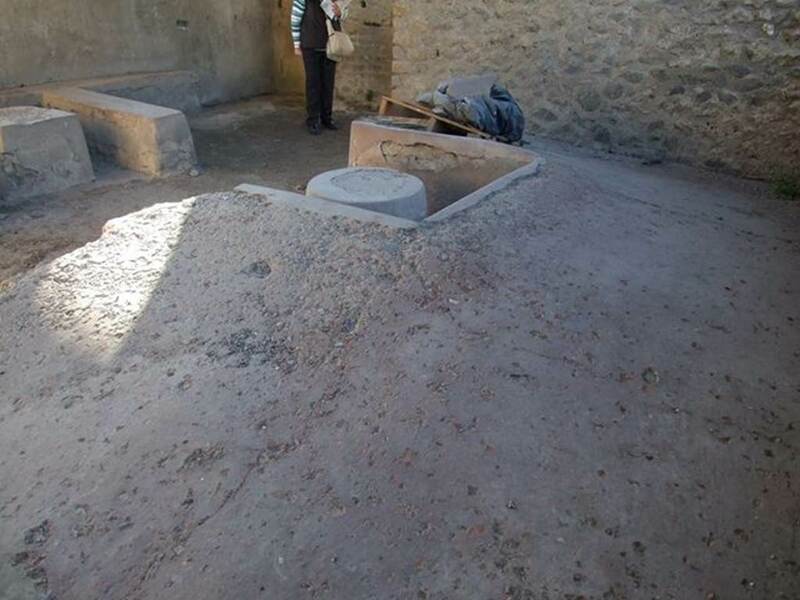 Looking west along counter towards five stuccoed masonry steps for storage of drinking and eating vessels. II.4.7 Pompeii. May 2003. Looking west through window into II.4.6. Photo courtesy of Nicolas Monteix. 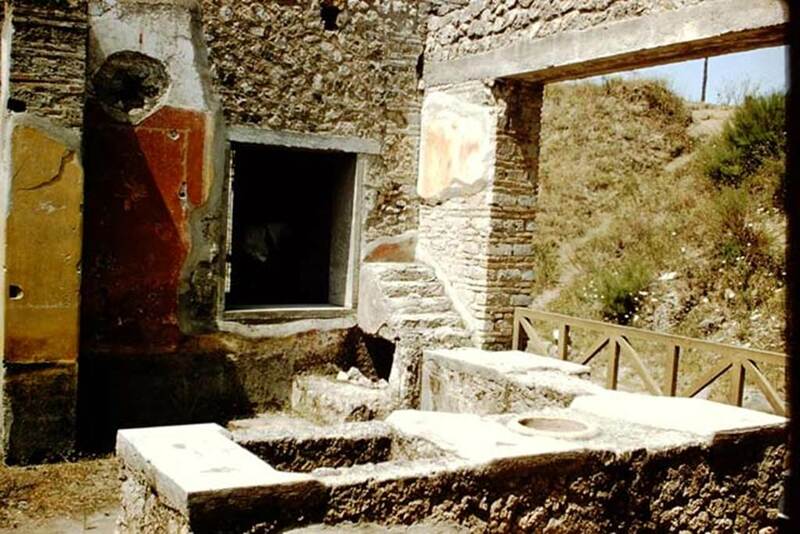 II.4.7 Pompeii. 1959. Looking north-west along counter towards five stuccoed masonry steps for storage of drinking and eating vessels. II.4.7 Pompeii. December 2005. Looking south across counter. II.4.7 Pompeii. December 2005. Looking south along counter. 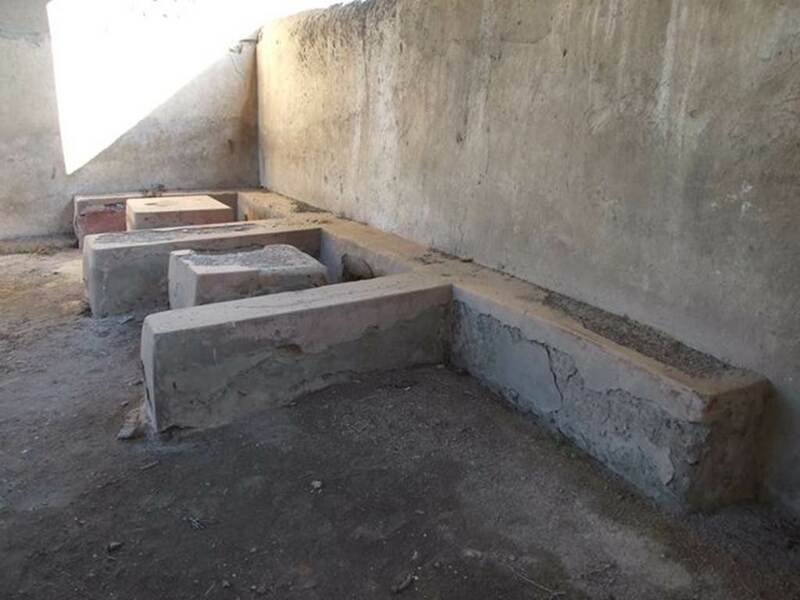 According to Parslow, when this wine shop was excavated in 1933, only partial remains of an L-shaped masonry counter were found. This had been robbed of its marble surface. II.4.7 Pompeii. December 2006. Looking north into II.4.7 from II.4.6. II.4.7 Pompeii. December 2006. Looking north towards Via dell’Abbondanza. II.4.7 Pompeii. December 2006. Rear of food counter, looking north. II.4.7 Pompeii. May 2003. 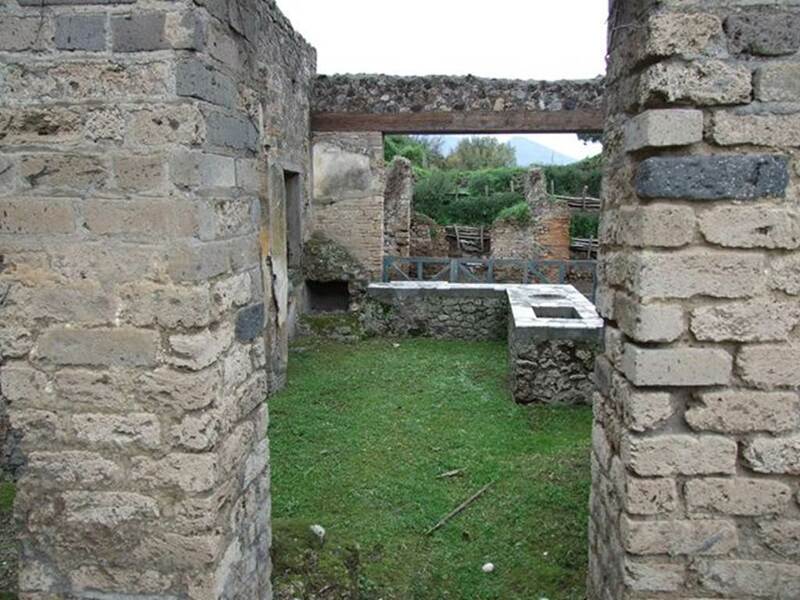 Looking north across rear of counter towards doorway on Via dell’Abbondanza.